STAMFORD — Six months ago, New Canaan goaltender Mac Wright and his bad hip couldn’t bother with hockey skates, sticks or pads. Saturday afternoon, the FCIAC championship game MVP couldn’t escape them in a pile of euphoric teammates, who swarmed him for leading them to another title win. With a 5-2 victory over rival Darien, New Canaan claimed its third FCIAC crown in the last five years at Terry Conners Ice Rink on Saturday afternoon. Wright made 24 saves on the day while captain Jack O’Rourke spearheaded the offense, tallying two goals and two assists. The Rams fought back from an early 1-0 deficit to score five times in the final 20 minutes. Wright, who has been dealing with a severe hip rotator strain the last two years, gave his slow-starting teammates a hand by limiting the Blue Wave to one goal over the game’s first 33 minutes. Despite Wright’s hot start, Darien lit the lamp first when senior Tommy Watters tapped in a loose puck off the goaltender’s back at 11:48 left in the first period, following a feed from Owen Koorbusch. 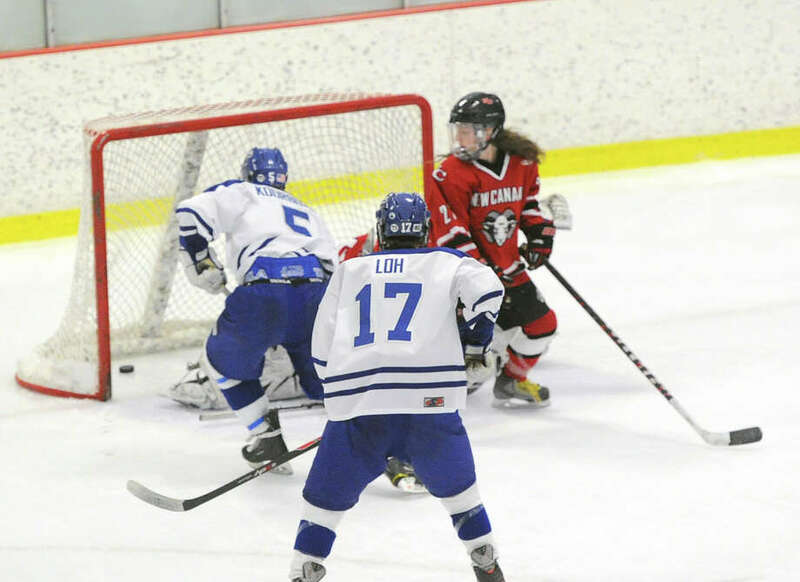 However, the FCIAC’s top-seeded club didn’t score again until New Canaan had taken a 3-1 lead into the final period. The Rams began rolling late in the second period, when Watters was hit with a two-minute slashing penalty inside his defensive zone at the 4:59 mark. Five seconds later, New Canaan tied the championship game with a Peter Reinhardt power-play goal assisted by Max Begoon. 20 seconds after the initial score, O’Rourke put home a go-ahead goal on a perfect feed across the low slot from Drew Morris. New Canaan defenseman James Franzis then nearly handed the game back to Darien via a slashing penalty of his own, but Wright came through with a spectacular save that denied the only scoring threat of the power play. A mere 13 seconds into the third period, O’Rourke found Morris all alone at the left point, where he blasted home the eventual game-winner. Darien managed to cut the Ram lead to one at 7:54 to go, but O’Rourke shut the door quickly with an assist to Harry Stanton and another goal in the last two minutes. New Canaan’s FCIAC title gives them 18 boys hockey championships all-time, 10 of which have come under current head coach Bo Hickey. The Rams will next take on Northwest Catholic in the first round of the Division-I state tournament Wednesday at 6 p.m. inside Darien Ice Rink. Following the game’s conclusion, the Blue Wave will battle Greenwich beginning at around 8 p.m.